Taste is evident in this sleek, modern, style and design. Feel the quality by the weight of it in your hand. 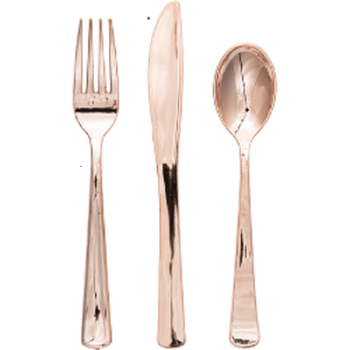 See the close resemblance to real silverware in its perfect size, proportions, and rose gold finish. Upscale, heavyweight and disposable. Rose Gold Plastic Cutlery Set - Teaspoons, Forks, Knives 24ct. LOOKS LIKE REAL! Rose Gold Plastic Cutlery Set - Teaspoons, Forks, Knives *Case of 120* LOOKS LIKE REAL!